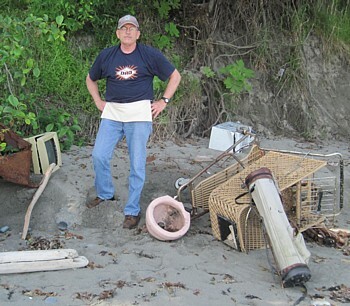 Odyssey Newsletter - Garbage on Beach - Ouch! We hope you are able to cool off if you're suffering the heat wave affecting many areas. Lin and I are still in the beautiful Pacific Northwest of the United States; probably one of the few areas where the weather has been below normal temperatures so far this year. We have been able to appreciate the beauty of the beaches, though, with trips to North Beach and also Ediz Hook, close to where we are living. If you haven't had a chance to do it yet, please read the article on "How to Find a Good Sea Glass Beach." In that article, it talks about old home sites high on the bluffs above the beach. With erosion, backyard dumps that used to be a distance from the cliffs are now slowly falling into the beach area. 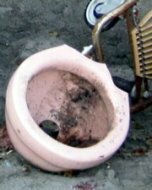 You'll see what we found last week in a few photos below in our "Garbage on Beach. Ouch!" article. You've still got a few hours to vote for the best photo this month! Please help select the BEST photo for this month. You can review all the photos for June by looking at their thumbnails, then clicking through to the ones you want to view. Follow the instructions on the individual photo pages to vote. Be sure to continue to vote on photos from the past months, also, if you haven't done so yet. Votes continue to pile up for photo of the year 2012. Last week Lin and I went to our favorite sea glass beach... and found that dumping on the beach continues. Old homestead sites on bluff. You can see a house currently at the top of the bluff in the trees. The bluffs here are about 200 feet high (rough guess). 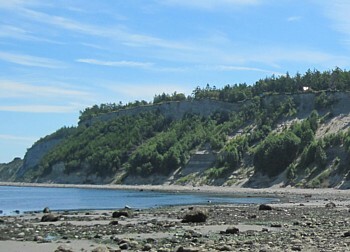 It's estimated that these bluffs are losing up from 2 to 10 feet a year due to erosion. Below the high, tree-covered bluff seen in the first photo, Lin and I came across this modern dumped stuff. There are only two ways that this trash could have gotten here. It either was dumped over the edge on purpose (we don't like to think this). Or it was dumped on the property in the woods near the bluff and erosion by waves has caused the cliff to crumble, bringing down what used to be on top. The only real glass you can see here is in the monitor screen to the left. We tried to figure out how this bike managed to be upright. The high tide of the previous night has left seaweed and stuff hanging on it with no sign of some other beachcomber having propped it up! 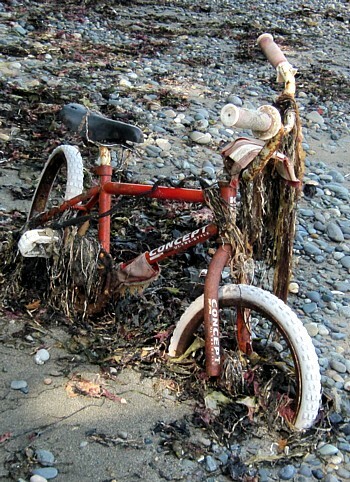 What conclusion do we draw from this example of "beach replenishment" here in the state of Washington? There are many areas where erosion is eating into pre-existing dump sites and the glass from those sites is ending up on the shoreline and beginning to turn into sea glass. Example: About 30 miles northwest of here is the Port Angeles city dump. This is a landfill that's being used at the present time. It's on the bluffs above the Strait of San Juan (Pacific Ocean). Efforts to stop the erosion of the bluffs are proving futile and a whole new lot of raw sea glass material is going to be available - thousands of tons over the years to come. Another example: Seaside and Sand City, California, are the towns nearest Fort Ord, a large military base which is now closed. 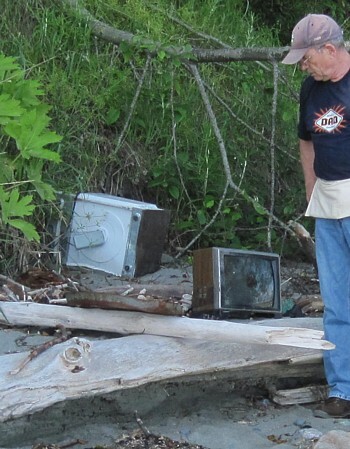 For many years, the base dumped its trash into the sand dunes behind the beaches. You can see literally millions of pieces of glass gliterring in the sand dunes, and the glass that is in the surf line now is producing some excellent rare finds. These are just two examples known to us - and if you think of beaches nationwide or worldwide, the same process could be repeating itself thousands of times. Lin and I feel that sea glass, on the whole, is being replenished at an amazing rate. What about the old standbys; the beaches where you could find so much glass 30 years ago? What has happened to that glass? I'll discuss what has really happened to much of that glass in a future article. Permalink -- click for full blog post "Atlantic side of Green Turtle Cay, Abaco Islands, Bahamas"
Permalink -- click for full blog post "Sea Glass - Bristol, North Somerset, UK"
Permalink -- click for full blog post "Sea Horse Sea Glass - June 2012 Sea Glass Photo Contest"
Alexandria Battery Bermuda, St. Georges Three years ago our visit to the cave was something very special, today however the cave has declined considerably!!!! Permalink -- click for full blog post "Sea glass cave"
Low tide and fog - Powder Point Bridge Long wooden Bridge to Duxbury Beach. A bit south of Boston, Mass. Permalink -- click for full blog post "Duxbury Beach Sea Glass Report"
Permalink -- click for full blog post "Best Blue Glass Ever Found - June 2012 Sea Glass Photo Contes"
Making Seaglass into a sphere for a ring? Permalink -- click for full blog post "Making Seaglass into a sphere for a ring?" Blue sea glass "H" and "THE"
Permalink -- click for full blog post " Blue sea glass "H" and "THE""
Permalink -- click for full blog post "It's Radioactive! - June 2012 Sea Glass Photo Contest"
What are these green "bump" things? Permalink -- click for full blog post "What are these green "bump" things?" I've caught the sea glass bug! Permalink -- click for full blog post "I've caught the sea glass bug!" Permalink -- click for full blog post "RockView"
Permalink -- click for full blog post "Foggy Finds - June 2012 Sea Glass Photo Contest"
Permalink -- click for full blog post "Eagle Eye Seaglass Treasures - June 2012 Sea Glass Photo Contest"
Permalink -- click for full blog post "Foss Park in North Chicago - Sea Glass Report"
Greetings from South Haven, Michigan Sea Glass Report on Van Buren State Park just south of South Haven, MI Went here on 6/5/12. Permalink -- click for full blog post "Van Buren State Park"
Permalink -- click for full blog post "Tourmaline Beach, San Diego, CA"
Permalink -- click for full blog post "Red found on the Eastern Shore - Virginia - May 2012"
Glass Bottle Top with "...OYAL" and then "HR..."
Permalink -- click for full blog post "Glass Bottle Top with "...OYAL" and then "HR...""
Permalink -- click for full blog post "Rare Red - June 2012 Sea Glass Photo Contest"
Permalink -- click for full blog post "Thurlestone Sands, Devon, England Sea Glass Report"
Permalink -- click for full blog post "Grant Park Beach"
Permalink -- click for full blog post "North Beach Park"
Permalink -- click for full blog post "Pennoyer Park"
Permalink -- click for full blog post "2011 February 16th - Punta Sal Peru - Sea Glass"
Permalink -- click for full blog post "I love the Sea"
Monroe, Michigan-Sterling State Park. Found browns,greens,whites,and and excellent blue with a small E on it. Great public beach on Lake Erie,easy access. Permalink -- click for full blog post "Sterling State Park Beach Glass Report"
Permalink -- click for full blog post "Manhattan Beach California Sea Glass Report"
Permalink -- click for full blog post "Swartvlei Beach, Sedgefield, South Africa"
Permalink -- click for full blog post "Piece of History"
Permalink -- click for full blog post "Mero Beach, Dominica - Sea Glass Beach Report"
Permalink -- click for full blog post "Keyes Beach in Hyannisport, Massachusetts"
Permalink -- click for full blog post "Seaglass Mosaics"
I CAME ACROSS SOME SEA GLASS AT AN ESTATE SALE. THEY TOLD ME THAT THE COUPLE COLLECTED SEA GLASS ON THEIR TRAVELS. I DO NOT KNOW WHERE THE CAME FROM. 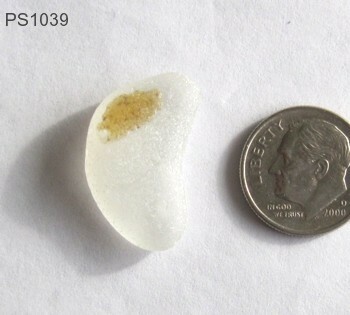 Permalink -- click for full blog post "IDENTIFYING MY SEA GLASS"
Permalink -- click for full blog post "Sea Glass Reds"
Permalink -- click for full blog post "2/5/2011 Sand City Ca UV Glass - Catch of the Day"
UV Glass, Ultraviolet, Vaseline, Uranium Glass - What is it? Permalink -- click for full blog post "UV Glass, Ultraviolet, Vaseline, Uranium Glass - What is it?" Permalink -- click for full blog post "Seaside, CA (6 visits in 2010-2011) Sea Glass Rainbow"
Going Marbles Over Sea Glass! Permalink -- click for full blog post "Going Marbles Over Sea Glass! " can i sell my sea glass? 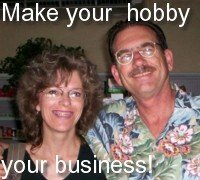 Permalink -- click for full blog post "can i sell my sea glass?" Permalink -- click for full blog post "MULLINS BAY, BARBADOS Sea Glass Report"
Permalink -- click for full blog post "Coney Island NY"
Permalink -- click for full blog post "Glass Beach Mendocino"
Permalink -- click for full blog post "Dark Blue Seaglass?" Ohio, Lake Erie Sea Glass Where? 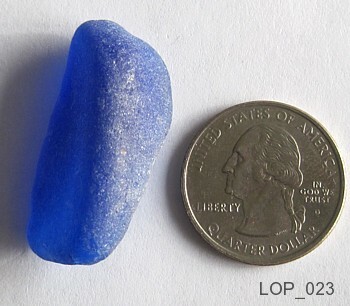 Permalink -- click for full blog post "Ohio, Lake Erie Sea Glass Where?" Permalink -- click for full blog post "Jewel of the Chesapeake"